You are here: Home » MEDIA » Books » The Adjacent by Christopher Priest (book review). 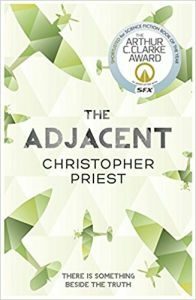 The Adjacent by Christopher Priest (book review). I hardly know where to begin in describing Christopher Priest’s ‘The Adjacent’. It’s a multi-stranded novel that alternates the tale of Tibor Tarent, a free-lance photographer in near-future Britain, with a selection of tales from earlier time periods and other places that feel like they are almost related somehow, without making the connection obvious. The individual sections, of which there are eight, have a wonderful depth to them. The characters, their motivations and their travels are each individually intriguing and enigmatic. All are caught up in events beyond their control: war, extreme weather and travel arrangements. While the concept of adjacency flirts with the background, suggesting what it may be, how it may affect the world and how it links the sections together. Some of them feel like they could be perfectly respectable standalone short stories and yet all of them are obviously adjacent, somehow, to the main narrative of the novel. Tibor Tarent’s wife was killed while working in Turkey by a mysterious weapon that could also be responsible for a terrorist attack on London. Tibor is shipped back to Great Britain where he is swept up in a world of bureaucracy and military secrets and transported from location to location in expectation of being debriefed over the attack. These sections form half the book and become curiously hypnotic as we struggle, along with Tibor, to understand where he’s being taken and why and what has happened to the country. It’s a nation swept by natural disaster and political turmoil, but Christopher Priest does not stoop to explaining things to his readers. We’re left to piece things together, to intuit the background and feel our way through the blurry outline of the plot. As Tibor’s memories and perception are affected and as the other characters’ lives slide subtly from one seeming-reality to another, I began to think that the very book was also affecting my mind and perceptions and memory. Incidents and names were familiar, though I couldn’t remember which part of the book they came from. Characters’ lives overlapped, but not necessarily in a way that made cogent sense. I was completely drawn in. Christopher Priest’s descriptive work is fabulous. Even on a dull and repetitive journey by train or by armoured vehicle he builds up a convincing picture of the landscape, the tedium of travel and details of fellow passengers. Tibor Tarent’s vocation as a photographer gives him an interesting perspective on everything he sees and on the people he meets. He notes interesting details and captures telling portraits of those he encounters and this, in turn, gives us the reader an insight into his experiences. By the end of the book, I still was not entirely sure what had happened and what I had just experienced. There is no traditional narrative here, no regular plot that you can get hold of to anchor you to where you are in the book. It was an enthralling experience to read, pausing at the end of each section to try to assemble an opinion on what I had just read, trying to tie it all together. As I closed the book on the final page, my mind was still a whirl. It’s truly a book you have to experience rather than just read. The Islanders by Christopher Priest (book review). The Gradual by Christopher Priest (book review). « Mentats Of Dune (Dune Schools Of Dune Trilogy 2) by Kevin J. Anderson and Brian Herbert (book review).